I always had this fascination that everyone in the whole world lives under the same sky. This haunting feeling of knowing that everyone in the whole world stood under the same sky. it gave me a sense of connection and belonging to the world in general. Singing for me has always been a way to express,it gives me a feeling of connection, and the joy of playing with other musicians the feeling of when we are all in sync is hard to describe,it is truly a wonderful feeling a gift I am so grateful for. I love to talk to other artists and have been enjoying my experience with Montclair TV 34 on 'Arts Up Close'. I like to connect the stories behind the art ,how we all have experiences we want to share,to heal us and others. A thrill to work with such a musical icon. Two adopted people born the same year,different colours, born in different countries. And yet the exact same desire to speak our truth,to use our music to express the need for change and openess. A couple of years ago I was lucky enough to meet up with Andrew Cohen one of the most creative photographers I know. We started working together,I love how Andrew sees the world ,how we collaborate and how we both have the same vision,showing emotion and different personas through photographs. This shot was taken in Asbury Park next to a painting of a mermaid. I felt very mermaid-like myself that day. Zara is an adoption advocate, professional speaker, author and songwriter. Zara is an adopted person in reunion with her birth mother. She has spoken over the years on the subject of adoption and the lifelong impact it has on people. Her topics have included becoming a mother, addiction, search and reunion. Zara facilitates groups with adopted teens empowering them by storytelling and using music to help them process their feelings. 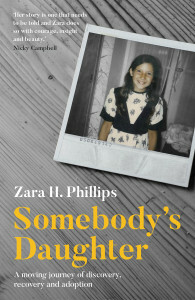 Zara’s new book “Somebody’s Daughter”, published by John Blake/Bonnier Publishers, was relased February 2018 in the UK and August 2018 in the USA. More information to come about this moving journey of discovery, recovery and adoption.